It’s hard to believe that we’re more than half way through August. Depending on where you live and the type of school system you’re in, kids may already be back to school but the majority of kids have a couple more weeks to enjoy before hitting the books again. There is a local radio station trying to fundraise and gather a bunch of school supplies for local underprivileged children. It’s funny, I always think about stuff like food and shelter but don’t often think about the necessity and cost involved with stuff like school supplies, after all it was something my mom always just took care of. The station has been quite successful and I’m glad too since having school supplies may be the key to getting out of poverty for some of these kids. 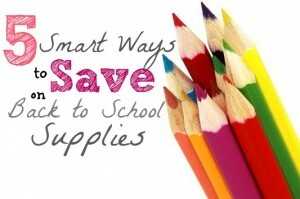 There’s no doubt that proper school supplies are expensive but there are, like most things, way to save. I used to beg my mom for a new zipper closed binder every year and most times she’d say no since there was nothing wrong with my old one. Since she was buying I didn’t have much room for argument but she was right. If there is something that can be reused (zipper binders, book bags, math sets) do it! If you take care of your stuff there’s no need to re-buy everything each year. At least this is the case with post-secondary kids. There is often no need to buy brand new text books. I never had any issue (in two university degrees) buying used books. Unless the texts were changed entirely, and they rarely are, I could always get away with using an edition one to two years old, the profs often giving the readings to multiple editions for this very reason. If there’s a really great sale on an item you’ll know you’ll use (like paper and pens) stock up for a few years. I remember one year packages of loose-leaf paper were on sale for $0.09 with no limit. My mom bought enough for almost four years’ worth of education for my sister and I. Obviously this is space limited for certain items. Pay attention to local sales and shop around. A lot of larger box stores will not only price match but beat by 5-10% with can add up to a large savings in the long run especially if you have more than one kid! For things like school clothes, though there are good sales late summer pending fall return to school, I find the best sales for clothes to be after Christmas. Though this is often an expensive time of year anyway, if you can, it may save you money for upcoming school years to buy clothes then instead of August/September. School definitely isn’t free, there are plenty of costs involved from supplies, clothes and projects year-round. If you have time to properly plan what, when and where you’ll buy certain things though, it could save you a ton of money!